Get notified when Aron has an upcoming show or classes! Fill in the fields above and press "Return" to subscribe. 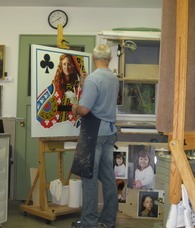 Aron Hart is an award-winning artist and art instructor, living in the Seattle area. He specializes in oil paintings and drawings. Dedicated to learning, Aron has continued to develop his skills over the years, studying locally and abroad, and most recently completing three years in the Drawing and Painting Atelier program at Gage Academy of Art. He also teaches at Gage Academy of Art.